ISO IEC 38500 and COBIT 5 describe the fundamental governance responsibility to ensure business value is derived from IT services. In this presentation, Bill Powell will cover practical aspects of adopting cloud strategies and avoiding predictable business risks in cloud deployment planning and clarifying critical management responsibilities. 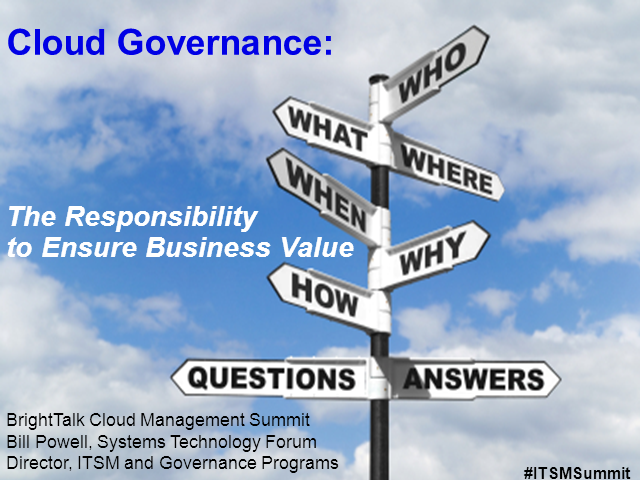 By leveraging the information in this presentation, oversight boards will be better prepared to evaluate, direct and monitor cloud management responsibilities and business risks.